Here’s a great site for book-lovers to share their favourite books and find other books they’re likely to enjoy. It’s easy to create an online catalogue of all the books in your collection (just enter the ISBN number) – You can then rate or review each book, and connect to other LibraryThing users who share your favourite writers or books, making it easy to get book recommendations from other readers with similar literary tastes. Last year I described the main World Book Day site as a wasted opportunity. This new site to mark the event’s 10th birthday still seems a bit pedestrian compared to some of my favourite literary sites but it’s a big improvement on last year’s effort. Features include a vote for the 10 Books Your Can’t Live Without, a competition to win a spa weekend by identifying which book featured particular quotations, and a quiz which challenges you to guess which favourite book is shared by a pair of authors or celebrities. This Cliché Finder offers a unique service- a fully searchable database of over 3,300 cliches. There’s one for every occasion, and at the end of the day you can’t say fairer than that. Meanwhile this cliché finder is useful if you want to ensure that your writing is cliché-free. Simply paste a few paragraphs into the form on this site, and it will check your prose against clichés listed in the Associated Press Guide to News Writing . Any clichés found will be highlighted in red, enabling you to find an alternate fresher way of saying the same thing. When all’s said and done, there’s no better way to tie up the loose ends in your writing, or I’ll eat my words. The shameless plug starts here. 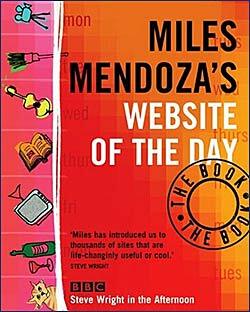 If I had a fiver for every time someone had said to me "You should do a Website of the Day book", I’d have well over twenty quid by now. Maybe even £25 actually. But once I’d given the idea some serious thought, I realised there might be some demand for a webby book that’s not remotely geeky. So in my ongoing bid for multi-media super-stardom (or something), I spent the spring and summer turning the Website of the Day archives into a book. The whole thing is cunningly designed to appeal equally to people who wouldn’t be seen dead anywhere near a book about the internet, and those who fancy themselves as webby know-it-alls. It’s got lots of lovely pictures and thousands of links (many of which have never featured on the programme). I’ve tried to make it the kind of book you could enjoy on the bus or in the bath – It’s chatty and enthusiastic (like the on-air feature) and there’s stuff in it for your parents and for your kids as well as lots of fantastic sites you won’t have found for yourself. You’ll find detailed guides to getting the best broadband deal, spambusting, legal music downloads, online DVD rental, family history research, eBay and route-planning. The whole thing starts with 15 sites you can’t live without then moves onto sections on Online Shopping and Money Saving, Travel, Music, Film & Telly, Kids Sites, Extreme Sports, Retro Sites & Nostalgia. And of course there are plenty of the kind of daft sites which have been the bread and butter of the on-air feature – games, diversions, timewasters, bets, quests and silly stories. Rent A Peasant, Skateboarding Bulldog, Big Whale on a Lorry, The MC Hammer Project and Banana George (the legendary nonagenarian jet-ski enthusiast) are all present and correct. As you can probably tell, I’m really proud of it. I would say this, but it’s a fantastic Christmas present – and it’s in the shops now – Waterstones, Smiths, Borders, Tesco etc etc (and the BBC Shop of coure). Please make my Mum happy and order a copy!